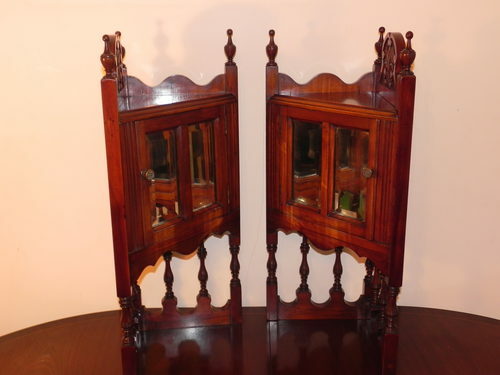 DescriptionThis matching pair of beautiful deep mahogany corner cupboard units are in excellent antique condition. Victorian period piece, nice to find two together. Perfectly sized for a small period room. Each has two oblong deep bevelled mirrors to the door, with brass hinges and handles, 3 finials and a gorgeous Art Nouveau decorative panel with spindles to the base, the whole ensemble is very appealing. FREE UK DELIVERY Please do not hesitate to email or call for more information or photographs. DimensionsHeight 27" inch (c. 68.5 cm) Width 15" inch (c. 38 cm) Triangular b DateVictorian ConditionExcellent - See Photographs Price£ 295.00 FREE UK DELIVERY - Overseas enquiries welcome.